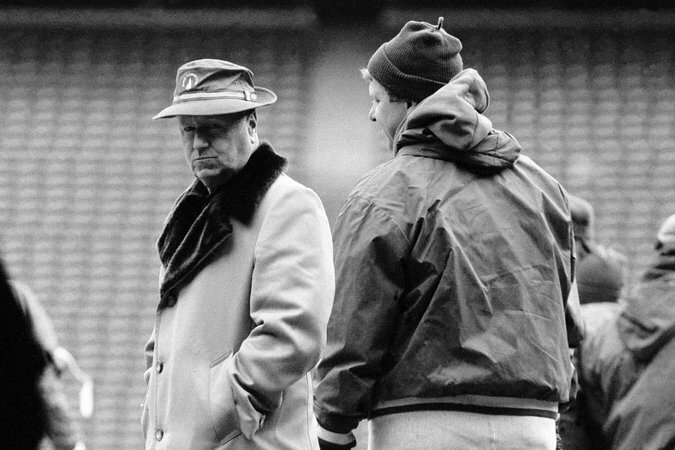 Mickey Corcoran, left, with Bill Parcells in 1987, when Parcells was coaching the Giants. Corcoran often attended practices. Mickey Corcoran, a prominent figure in New Jersey athletics who coached Bill Parcells in high school basketball and then mentored him throughout Parcells’s Hall of Fame career as the coach of four N.F.L. teams, died on Sunday at his home in Dumont, N.J. He was 93. His wife, Dolores, said he had a brain tumor. Parcells confided in Corcoran whenever he was confronted with a career decision, as happened in January 2002. Parcells had spent the 2001 National Football League season as an ESPN studio analyst after resigning from the Jets as their director of football operations. Then the Tampa Bay Buccaneers offered him a four-year, $16 million contract to be their head coach.